We’d love your help. Let us know what’s wrong with this preview of In the Name of Honor by Dayton Ward. To ask other readers questions about In the Name of Honor, please sign up. Set between Star Trek V and VI, this was a decent read... although the plot was a bit too close to Star Trek VI for my tastes. I would have finished this book sooner, but I forgot to take it with me when I had to go on a business trip. It is a fun read; it takes place between Star Trek V: The Final Frontier and Star Trek VI: The Undiscovered Country. It has a nice flow to it; it utilizes characters from the original series; it keeps one's interest throughout. It also has an unlikely pairing of Sulu, Kirk, and Koloth in the course of the story. The Klingons are seeking a peace treaty with the Federation; the Klingon Counc I would have finished this book sooner, but I forgot to take it with me when I had to go on a business trip. 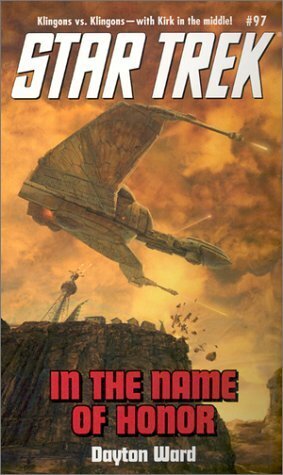 It is a fun read; it takes place between Star Trek V: The Final Frontier and Star Trek VI: The Undiscovered Country. It has a nice flow to it; it utilizes characters from the original series; it keeps one's interest throughout. It also has an unlikely pairing of Sulu, Kirk, and Koloth in the course of the story. The Klingons are seeking a peace treaty with the Federation; the Klingon Council is split between those who seek peace and those who are not happy with the process. During the peace process, Kirk and Co. discover that the Klingon have Federation POWs in their power kept hidden from the Federation; they were to have been used as bargaining chips. Now, though, most Klingons have forgotten they exist and some wish them dead as they have become an embarrassment to the Klingon High Council. There are also Klingons who do not wish for peace to occur and seek to sabotage the peace talks. So we have the interesting pairing of Spock talking with some Klingon ambassadorial aides and considering becoming an ambassador himself, Chekov working with a Klingon security officer to solve the mystery of who is trying to sabotage the peace process, Uhura working with a Klingon communications officer to IMPROVE some Klingon programs, and Scotty working with a Klingon engineer to save a Klingon vessel. So it was interesting to see these various groups working together for a common cause despite having such enormous cultural differences they have to overcome. Kirk, Sulu, and Koloth head to a specific prison planet that Gorkon has learned houses eight surviving Federation crew in members, including a member from the TOS crew. Their intent is to rescue these prisoners and return them to the Federation. It is interesting to read how Kirk has to handle his emotions over his son being murdered by Klingons in light of the Klingons claiming to value honor and hold honorable actions in such high esteem. It also helps tie the book into the sixth movie rather well. The book attempts to explain the differences between the Klingons in the original series episodes and the movies [and Next Gen/DS9 episodes], but it does so in a fashion that does not really explain anything. That was kind of a disappointment, on the one hand. At the same time, it is somewhat funny as Koloth does not want to talk about why there are two groups of Klingons; he makes it very clear to Kirk at various times it is an uncomfortable topic and not fit to discuss with a human. Overall, I enjoyed the book. One of the better books in the series, in my opinion. This is the first Star Trek book I've picked up in a long time, and I'm glad that I did, as this book is really good! Set between the fifth and sixth books looks at the drive for peace between the Federation and the Klingons while also exploring the way the Klingons changed between the original series and the Next Generation from a Federation viewpoint. I enjoyed the way he dealt with the stark differences in attitude between TOS and TNG Klingons and managed to make the transition between the tw This is the first Star Trek book I've picked up in a long time, and I'm glad that I did, as this book is really good! Set between the fifth and sixth books looks at the drive for peace between the Federation and the Klingons while also exploring the way the Klingons changed between the original series and the Next Generation from a Federation viewpoint. I enjoyed the way he dealt with the stark differences in attitude between TOS and TNG Klingons and managed to make the transition between the two believable, and the book presents a good back story for the developments that occoured in The Undiscovered Country. Now this is much more to my taste. A story set in my beloved TOS movie era, some expert retconning in the lead up to "Star Trek VI" and beyond, plenty of fanwank elements that avoid being simply gratuitous, all wrapped up in an exciting (if not exactly original) action adventure plot. After reading this, you'll definitely agree that we all need a bit more Koloth in our Trek literary outings. Too much jabbering referencing the movies. (Casual fans like me don't care, and avid fans already know.) Some very amateur bits of writing that another reader could have suggested needed help. Interesting Klingons. Our favorite original series characters were all there, but doing & thinking stereotypically. I think I've finally outgrown the franchise. Pretty good. A few implausible plotlines. First of all are we to believe Kirk is happy to engage in the peace process with the Klingons just prior to Star Trek 6 where he is pretty bitter towards them? Also as a rule prefer adventures set during TOS rather than later stuff but not bad. An exciting, action-packed, and well-written novel from Dayton Ward. I especially liked his take on the Klingons, and his writing lent them a diversity and depth that is sometimes lacking in other works. The turnaround for Kirk at the end, while necessary for the setup to Star Trek VI, felt a little off. Again, though, that is not the fault of the writer, but rather where the character is in the film. The scenes in the prison camp were particularly well-written, and I found myself empathizing wi An exciting, action-packed, and well-written novel from Dayton Ward. I especially liked his take on the Klingons, and his writing lent them a diversity and depth that is sometimes lacking in other works. The turnaround for Kirk at the end, while necessary for the setup to Star Trek VI, felt a little off. Again, though, that is not the fault of the writer, but rather where the character is in the film. The scenes in the prison camp were particularly well-written, and I found myself empathizing with the minor characters who had been created for this story. I also enjoy seeing characters who had minor roles in televised Trek showing up in the novels and given a bit more to do, and In the Name of Honor uses a number of those characters very well. A truly solid novel, and one of the better TOS novels from this era that I've had the pleasure of reading! Ward weaves a good story that is quite evocative of the setting and the characters used. I particularly liked his characterization of Koloth. Just completed my second read and it was just as enjoyable as the first time. The characters are well developed in this story,with a good plot,makes me think about all the peace talks man has held,but this 20th century is filled with violence,only God's Kingdom can bring about lasting peace on this beautiful earth!!! Very dramatic, 'noir', book. Well-written, nicely fitting in the series and bridging a gap between stories from the past and the future, but not 'nice' at all. Absolutely necessary to be read and certainly worth it. Plays for a big part in Klingon space. Follows on from the adventure at the centre of the galaxy in the fifth Star Trek movie. More readable than some others in this series. Dayton is a software developer, having become a slave to Corporate America after spending eleven years in the U.S. Marine Corps. When asked, he’ll tell you that he left home and joined the military soon after high school because he’d grown tired of people telling him what to do all the time. Ask him sometime how well that worked out. In addition to the numerous credits he shares with friend and co Dayton is a software developer, having become a slave to Corporate America after spending eleven years in the U.S. Marine Corps. When asked, he’ll tell you that he left home and joined the military soon after high school because he’d grown tired of people telling him what to do all the time.